Such an amazing film. I love how it starts bravely, depicting the neighborhood from the pov of the children with little to no dialogue, and how it slowly switches to narrate its plot. It says so many things about poverty in the US, capitalism, and motherhood and it does it in the most gentle way even though it focuses on a filthy side of the country that so many try not to look at. Easily one of my favorite films. Ever. Yes, that is a bold statement. I stand by it. I looked forward to watch this movie but all it did was to decide that I don't ever want to have kids. Starts a bit rough, but progressively becomes something great. There isn’t really a good central character to anchor the film, Dafoe’s character is probably the closest we get to this. The kid-only scenes get slightly tiresome early on, but it’s nice to see a realistic portrayal as opposed to what we usually see in film. Well directed, acted, and the characters (even the mom) earn my sympathy quite often. I love this film in theory. In practice though, watching kids yell for two hours can only hold so much of my interest. I feel like it could have benefited from a stronger narrative through line and a more definitive ending. Willem Dafoe is a treasure though. 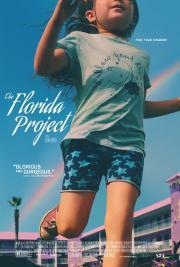 With The Florida Project, Sean Baker has crafted a naturally flowing film with emotionally engaging characters. The admirable thing about this movie is how it treats all of its characters with such care and understanding. Its contrast between the innocence of the children and the weight of what's actually happening puts a unique tint on the film. The kind of crawling, self-indulgent character drama that only works if you're building up to something great. As it stands, this film takes its sweet time advancing toward one of the worst endings ever seen in Oscar-bait, a jarring 30-second GoPro shot that will leave you utterly confused about how a climax like that ever got greenlit to begin with. Contemporary US seems more and more like a decaying USSR, where a vast majority lives in collective housings, with nothing but bad food and bad TV, while elites enjoy all the power and luxuries. Or maybe USSR was even better: at least people did not have to prostitute for bread and butter, nor for housing, right? Very strong movie which narrates a harsh political story with dream-like naturalism and follows the protagonist with utmost compassion, eschewing any paternalist gaze. Great cinema. Bir çocuk oyuncu performansı arkasına saklanmış gereksiz uzunlukta bir giriş bölümü, dolayısıyla asıl derdini anlatamaya zamanı yetmeyen ve bunu sonuç bölümünde ucuz bir duygusal ajitasyon ile örtmeye çalışan vasat bir film. This is an amazing way to tell a story. Both delivering the wonders of being a kid, and the hardships of being a single mother poverty.. Such a great film in its ways of showing the tough part of life.. Great directing, great acting, great script.. Only question mark in my head still is the very very very very end. You understand when you see. The acting in 'The Florida Project' is really great, Brooklynn Prince and Willem Dafoe are terrific. The acting by the kids (who have never been in a movie before) is really good. The realism of director Sean Baker's characters are believable, such realistic performances. The most impressive part of the film is watching these young actors act. Baker's directing of these kid actors is amazing. This is a modern day fairy tale that takes place in a harsh reality known as..."The Magic Kingdom".